ITV 1 The Chase’s Shaun Wallace, aka The Dark Destroyer and Legal Eagle, signs book deal with Cranthorpe Millner Publishers for his autobiography, Chasing the Dream. 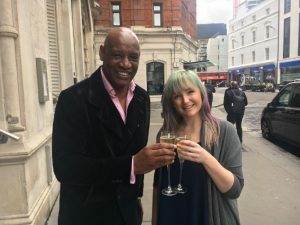 London, UK, 15th March 2018: Well-known Chaser Shaun Wallace, continues to chase the dream and signs a book deal with independent publishers London based Cranthorpe Millner. His autobiography is the result of many years of hard work and determination and will be an inspiration to anyone who has known the pain and hardship of trying to make it in a world filled with people who seem to be against you. On the 5th December 2004, Shaun became the first black person to win the BBC television quiz show Mastermind, and since then his career has catapulted and he is now a household name, appearing on ITV’s smash hit teatime quiz show The Chase as The Dark Destroyer. However, quizzing is but a small part of what makes up Shaun. He has been a devoted Chelsea fan since 1967 and a criminal defence advocate for over thirty-two years. Read how Shaun’s passions have helped turn him into the man he is today: staunchly just and fair, ruthless when he needs to be, kind, fun, and a fiercely loyal friend. Well done and congratulations Shaun!!! Looking forward to it. Well done and congratulations Shaun! Looking forward to seeing it. Whoop whoop. Fantastic news about Shaun Wallace! Would you be able to send me an ATI about Chasing the Dream? Is there any idea as yet when Shaun’s book will be for sale? Hi Jacinda, you will be able to pre-order Shaun’s book off our website in the next couple of days! When is this scheduled to be published please? Hi Aaron! Its official release will be in October, but the book will be available to pre-order off our website in the next couple of days, so keep an eye out!